In Apple: For What It’s Worth Jeff Matthews asks a question “about the most disturbing pattern coming out of Apple’s earning release: the measly 1% year/year revenue increase at Apple’s retail stores”. He notes that prior to the drop, Apple stores were growing at 36%. Such a huge drop quarter on quarter seems suspicious and he thinks something is happening. The concern is with that low growth between calendar Q3 last year and this year. That is being contrasted with the growth in the previous quarter (Q2) of 36%. When seen as a chart, the explanation for a big change in growth is perhaps easier. The third quarter of last year was a boom for retail and the quarters that followed were more-or-less similar in sales level. With this perspective, it’s clear that there was a surge in sales during the last year which did not repeat this year. But what’s the cause for this pattern? If we know the cause can we predict if retail sales growth will increase or decrease? The chart shows three different quantities. A “proxy” candidate for retail growth explanation: the sum of US phone activations and in-store CPU units sold as a stacked bar chart. The choice of proxy includes the blue bars which Apple reports as in-store “CPU units” and the US phone activations coming from AT&T and Verizon. We can see now that there is a strong relationship between iPhone sales growth and store sales growth. The Mac business is growing but not in the bursty way that iPhones are growing. The growth of US iPhones matches the growth in (US mostly) Apple retail. This should not be a surprise. 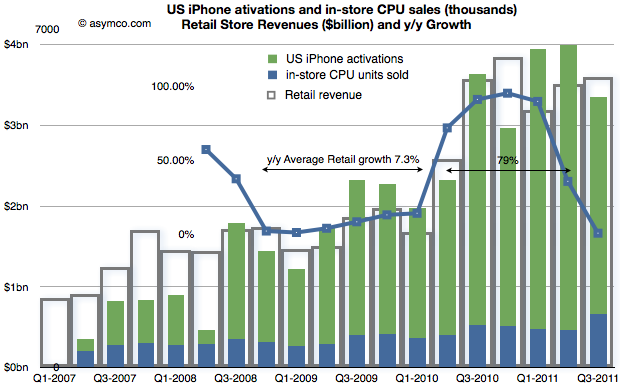 The bursty nature of iPhone means that store growth varies just as dramatically. I highlighted that during the period of Q4 2008 to Q1 2010, Apple store revenue grew at an average of 7.3% but following the “big bang” of the iPhone 4 launch they grew at 79% over the subsequent five quarters (because the comps were easy). In the latest quarter the growth dropped as there was no launch of a new iPhone to top the big bang of a year earlier. 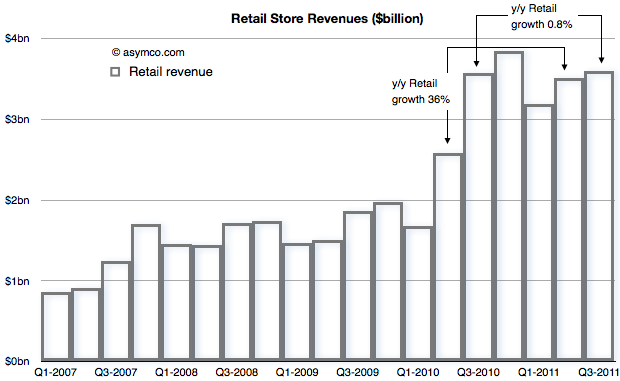 Even so, store revenues actually increased by a slight amount. Knowing that the comp with the year before was so tough the surprise isn’t that the growth slowed, it’s that there was any growth at all. If iPhone as a cause for growth in retail is to be believed, then how hard can it be to forecast retail growth in the future? Apple does not submit this information to the SEC but reports it (exclusively I believe) during the earnings conference call. Transcripts are available on seekingalpha.com but fortunately they are recorded as well by Gary Allen at ifoapplestore.com. I used US data for the iPhone as most of Apple stores are in the US. The global pattern is similar. I had to estimate Verizon units used during the last quarter as they have not been reported yet. I used a similar ratio between AT&T and Verizon as for the last quarter. 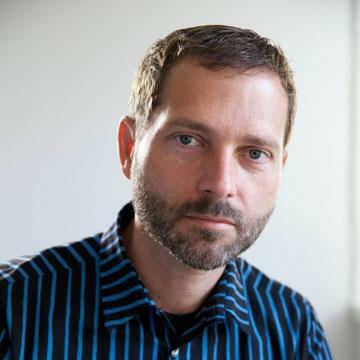 ‹ Previous Post Are Apple’s investments in PP&E extraordinary?